Imagine being able to manipulate a specific region of DNA in the genome of your favorite species almost as easily as correcting a typo in the latest draft of your dissertation. Well, that will probably never happen. Yet with transcription activator-like (TAL) effectors, scientists in several biological disciplines are coming closer to this DNA targeting ideal. Figure 1: (A) Representation of a zinc finger (ZF) nuclease. 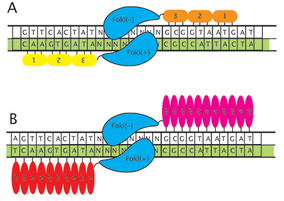 Zinc fingers recognize triplets and the FokI nuclease operates as a dimer, cutting in the spacer region between two distinct ZF target sites. (B) A TAL effector nuclease (TALEN). Similar in principle to the ZF nuclease, the components of the array recognize individual nucleotides. For over ten years, zinc finger (ZF) arrays have been the go-to technology for targeting enzymes and other useful protein domains to a specific DNA sequence ( Figure 1A ). Scientists have identified a large number of zinc fingers that recognize various nucleotide triplets. With some trial and error, ZF arrays are able to recognize their targets with fairly high specificity. Fifteen years of research has shown that when fused to a nuclease or activation domain, a ZF array is an effective targeting mechanism for molecular tools. ZFs are not without their limitations, however. Not every nucleotide triplet has a corresponding zinc finger, and interactions between zinc fingers within an array can reduce their specificity. Two years ago, groups led by Jens Boch at the Martin-Luther-University Halle-Wittenberg and Adam Bogdanove at Iowa State University published the nucleotide recognition code of the TAL effectors, which were isolated from the plant bacterial pathogen Xanthomonas. The central TAL targeting domain is composed of 33-35 amino acid repeats. These repeats only differ from each other by two amino acids, their repeat-variable di-residue (RVD). Ultimately, it is this RVD that determines which single nucleotide the TAL effector will recognize: ( Figure 1B ) HD targets cytosine, NI targets adenenine, NG targets thymine, and NN targets guanine (though NN can also bind adenenine with lower specificity). With the template for studying this type of technology already laid by the zinc finger community ( see interview with Adam Bogdanove ), progress on TALe research has been swift. The incentives are high. Since ZF targets are confined to sequences composed of triplets with corresponding zinc fingers, potential targetable sites in your average genome are every 500 bp. TAL effectors have some restrictions (for example, the target must start with a T), but they still have potential targetable sites approximately every 35bp. Researchers are still determining the importance of context for each TAL effector within an array, but early studies suggest the likelihood of context having a negative effect on specificity is on par with ZF arrays, if not slightly lower. Figure 2: Simplified representation of the Voytas/Bogdanove Golden Gate TALEN kit. In this example, the final array is composed of 18 TAL effector repeats. The kit can be used to make arrays from 12-31 repeats. Perhaps one of the most appealing features of the TAL effector arrays is the ease with which they can be made. Intuitively, one would expect that assembling relatively small, repeat-laden DNA regions into a single construct would be technically challenging. Thanks to efforts by the Bogdanove group and Daniel Voytas’s group from the University of Minnesota, arrays can be assembled in a matter of days. 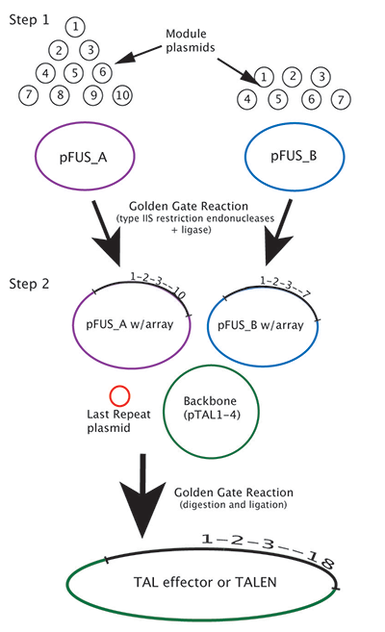 In an open access Nucleic Acids Research article that came out in the spring of 2011, the groups describe a set of customized plasmids that can be used with the recently developed Golden Gate cloning method to assemble “multiple DNA fragments in an ordered fashion in a single reaction.” Using these plasmids, which are available as a kit from Addgene , custom arrays consisting of 12-31 repeats can be assembled and inserted into a variety of backbones in just a few steps ( Figure 2 ). The Bogdanove group also hosts web-based software to help scientists find potential TAL effector targets. The site, which will be updated soon with more features, is already receiving hundreds of unique visitors every month. that provides several TAL effector resources. Whether you work in a C. elegans lab and have been struggling to mutate a specific gene or your anxiously investigating gene therapy options for a rare disease in humans, TAL effectors could become a key tool in your plasmid toolbox. Addgene has rapidly become an important resource for this new technology, and we hope to continue to have a strong scientific partnership with both the labs that continue to hone these tools and the researchers who are learning to wield them. Learn more about Addgene’s TAL effector and TALEN kits here . See the Q&A with Dr. Adam Bogdanove and his thoughts on the TALe technologyhere.